2003 was the year when my life turned to never be the same again. One particular day in February 2003 I went home from work to find a motor magazine (of wich I was a subscriber) in the mailbox. In the garage was my old 1963 BMW R 60 which I have had for some years (- now almost converted to an Indian, attending two International Indian Rallys). It was beyond my wildest dream to find a bike like this to own. In februari 2003 I could do nothing but dream. Roads with snow and ice were not suitable for practising footclutch-manouvers on a 1200 cubicinches bike, being unexperienced . The following spring and summer I just practiced to kickstart my beast, got to use the unusual shifting of gears and to ride in the neighbourhood. My first Indian meeting was an Indian Autumn Meeting that year. More Rallys followed. 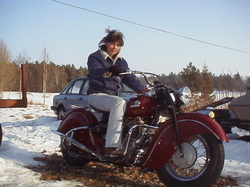 The year after (2004) I was at the Blodmyra rally, of wich I am pretty sure I was the first woman ever to arrive riding an Indian of my own. 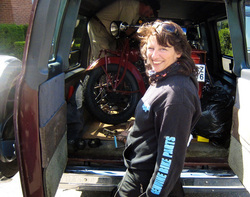 I was then told to plan for riding to France 2007 - over two years in advance by that time. 2006 I answered an ad in which was asked for people who wanted to travel all the way round the Baltic sea on Indians. It was my first great adventure. The trip ended up of a distance between 3500 - 4000 km (no one measured). We visited people all over Finland and Sweden. I had a gearbox breakdown during the trip. 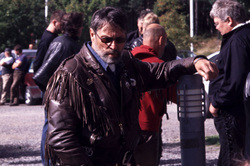 Åke was the Indian member who encouraged me to aim for going to France. I did not know how to realize it to start with. The Baltic Tour made the dream come closer. One day, when I had moved to a new place, I went to a farm to buy some eggs and there I happened to meet Lisbeth. I did not know many people around so we started to talk - Where do you live, what interests do you have etc. She had started to go for a driving license for motorcycle and I told her about my Indian. I also told her about my France-plan. Could I join - she asked? 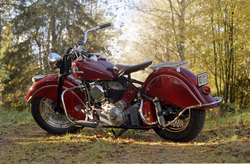 Next spring she had her own Indian101 Scout and she went to France with a new driving license in july 2007..
Åke himself did not go. I owe him a lot of thanks for the push. Coming from the International Rally of Finland 2008, Lisbeth had an accident. It was just her and me going to hit the ferry, leaving for Stockholm. Her bike stopped in front of me and she and the bike just tumbled round on the road. A lot of other Indian riders soon stopped around us, as we were lying on the ground by the side of the road. She was taken to a hospital in Finland and I have to go on on my own across Sweden. I think we both are affected of this, I am anyway. I drive with more care than ever and I do not take everything or every day for granted. 2010 - at last - Finn (the man I live with) wanted to go with me to the Indian International Rally in Norway - his own wild Viking homecountry. The bike (a Triumph) did not want the same, so he turned home on a trailer after driving for only one hour. Bad luck. We now have two Chiefs and I hope they both will behave and take us somewhere together in the future. Indians are like living things, they need love, care and want to be politely talked to. 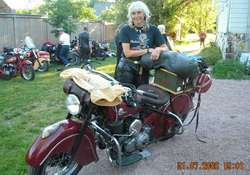 I am lucky to have my Indian Darling: Lisbeth to join when it comes to long distance rallys. Recently Lisbeth (and me) were trusted to arrange the Nordic Indian Meeting, 2010, right where we live. Next International Indian Rally in Sweden will happen 2017!!! That is something to look forward to for all of us. Jag hittade mitt underbara rödskinn i en motortidning, En radannons utan bild. Hade letat ett tag efter en äldre motorcykel men hade inte drömt om att jag skulle hitta en Indian. Första sommaren (2003) gick åt att erövra hövdingen. Åkte lite hemomkringoch så småningom till min första höstträff. 2004 tog jag mig till Blodmyraträffen och var med all säkerhet första kvinna på en egen Indian som visat sig där. 2006 åkte jag Bottenviken runt: - Blodmyra/Delsbo - Åland - Tammerfors - Kemi - Kalix - Arvidsjaur - Norsjö - Östersund - Orsa - Borlänge (och där hade jag bilen).. På Åland havererade växellådan. Det blev två dagars trevligt skruv-stopp. Förberedelsarna hade pågått i två år när det var dags att bege sig till Internationella träffen i Frankrike 2007. Jag hade läst franska (borstat upp gymnasiefranskan) under året! Det blev ett otroligt äventyr! Min kära reskamrat Lisbeth blev kvar på sjukhus i Finland efter Internationella träffen 2008. En sprucken mjälte med inre blödningar kunde kostat henne livet. Motorcykelåkning blir sig nog inte riktigt detsamma. Internationella Indianrallyt blir Sveriges 2017. Det blir nästan bara roligare för varje år att åka på Internationell träff med Indianvänner. I do hope you will like to be my Indian guest for a moment.